So, here I am back in the sultry Midwest, returned at about midnight the night before last from the sultry east coast and a professional conference. As frequent reader can tell, the change of routine played havoc with my blogging habits, which, with few exceptions (my son’s marriage in early July, for a happy example) have been fairly regular for the past three months since we began in earnest. So, let’s pick up where I left off, attempting to piece together an interesting series of articles linked together for me by Arts and Letters Daily , a wonderful site that I am guilty of visiting insufficiently regularly. BOSTON — Third morning, and last one, here at a conference sponsored by one of our enterprise’s primary IT vendors, IBM Lotus. Doubt we’ll finish this post until after we’re safely back on our home turf, but we’ll take a stab at getting some of this done before we pack up for the last few sessions. Boston is a great town for tourists, although in a business conference there is precious little time for tourism, but it’s been fun to walk around, at least a bit, and enjoy life at street level. This morning, of course, it’s pouring rain, so we’ll confine our observations from the 35th floor hotel room we’re about to vacate. Nice town. Great view. Science fiction at one time was despised as vulgar and “populist” by university English departments. Today, it is just another cultural artifact to be deconstructed, along with cartoons and People magazine articles. Yet one could argue that science fiction has had a greater impact on the way we all live than any other literary genre of the 20th century. When one looks at the great technological revolutions that have shaped our lives over the past 50 years, more often than not one finds that the men and women behind them were avid consumers of what used to be considered no more than adolescent trash. As Arthur C. Clarke put it: “Almost every good scientist I know has read science fiction.” And the greatest writer who produced them was Robert Anson Heinlein, born in Butler, Mo., 100 years ago this month. The list of technologies, concepts and events that he anticipated in his fiction is long and varied. In his 1951 juvenile novel, “Between Planets,” he described cellphones. In 1940, even before the Manhattan Project had begun, he chronicled, in the short story “Blowups Happen,” the destruction of a graphite-regulated nuclear reactor similar to the one at Chernobyl. And in his 1961 masterpiece, “Stranger in a Strange Land,” Heinlein–decades before Ronald and Nancy Reagan moved to the White House–introduced the idea that a president’s wife might try to guide his actions based on the advice of her astrologer. One of Heinlein’s best known “inventions” is the water bed, though he never took out a patent. It takes three articles to cover the spectrum of his writing and influence, so let’s continue. Heinlein was born in 1907 in Butler, Missouri, the son of a farm equipment salesman. Family connections with the Pendergast political machine in Kansas City won him an appointment to Annapolis. He identified proudly with the Navy for the rest of his life, although he was retired in 1934 because of tuberculosis, just five years into his active service. Heinlein sold his first S.F. story in 1939 and almost instantly became the acknowledged king of his field, under the tutelage of legendary Astounding editor John Campbell. In the Campbell era, with Heinlein leading the way, the S.F. magazines moved from didactic travelogues and amateurish intergalactic epics to intelligent treatments of politics, religion, and sociology. Heinlein was also the first S.F. writer to break into respectable “slick” fiction magazines such as the Saturday Evening Post after World War II, and he spearheaded the first sober space travel movie, Destination Moon (1950), in which private enterprise-beating back objections from early advocates of a sort of “precautionary principle,” who feared it was to unsafe even to try-makes it to the moon. The above quote is from the second of Arts & Letters articles, from Reason Magazine. Take a look at the rest of it. July 7 [was] the 100th anniversary of the birth of Robert Anson Heinlein. In Kansas City the Heinlein Centennial will celebrate his writings and feature talks by the NASA administrator Michael Griffin as well as Heinlein scholars and enthusiasts. Heinlein is the closest thing that the American pro-space movement has to a patron saint. What an amazing, inspiring, dazzlingly irritating (if one leans toward the sinister side of the political spectrum) far seeing visionary was Heinlein! That quote, from a man so proud of his love of freedom he once joked that “Ayn Rand is a bloody socialist compared to me,” shows yet another side to the Heinlein paradox. As a literary influence on the emerging libertarian movement, Heinlein was second only to Rand. Yet that statement of self-sacrifice and duty to the species seems as un-Randian as you can get. Heinlein, a human chauvinist, always believed freedom and responsibility were linked. But he would never have thought it proper to impose the duty he saw as the highest human aspiration. Robert Heinlein has been one of my favorite science fiction writers since I was a kid, and that love seems to have transmitted itself to at least one of my children, who reports that learning in 7th grade that his favorite science fiction writer was a Naval Academy graduate, made up his mind 5-1/2 years in advance to work to attend that astounding college. Who’s out there like him now? This entry was posted on Friday, August 10th, 2007 at 4:29 pm and is filed under Inspirational influences, musings, Science, Science Fiction, Technology. You can follow any responses to this entry through the RSS 2.0 feed. You can leave a response, or trackback from your own site. Hope you had a good trip to beantown. I’m impressed but not surprised that Heinlein is another thing we have in common, Clapso. 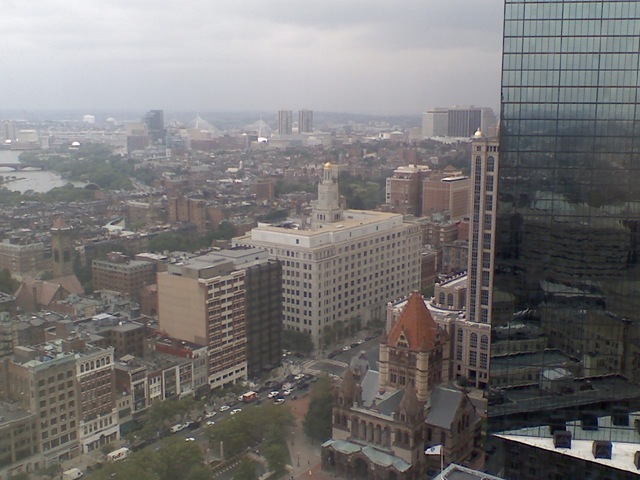 Beantown was good; the writeup will likely appear on the WcW page. For awhile,I believed i was concerned Star Trek was a dying franchise. Then JJ Abrams came along. Nice touch. The scene with kid Kirk was a bit too quirky in the movie, despite the fact that it was sizzling hot in the trailer. Star Trek XI breathed new life into this precious Roddenberry universe. I’d like to see all of this Enterprise cast come back for additional outings. I spent my childhood years with the authentic series. Heck, my dad got us a color Television just so we could watch Star Trek every Friday afternoon. Currently, I’m stuck on these new actors. In MHO, they’ve breathed life into their characters and made them their own. I, for one, am looking forward to more.